Researchers at the University of Strathclyde have joined partners in Kolkata, India to tackle the challenges posed by rapid urban growth. Cities are home to an ever-growing proportion of the world’s population, putting pressure on transport infrastructure, the environment and quality of life. Kolkata, with more than 14 million citizens, is the third-most populous urban area in India after Delhi and Mumbai and is among the largest and most populous cities on Earth. 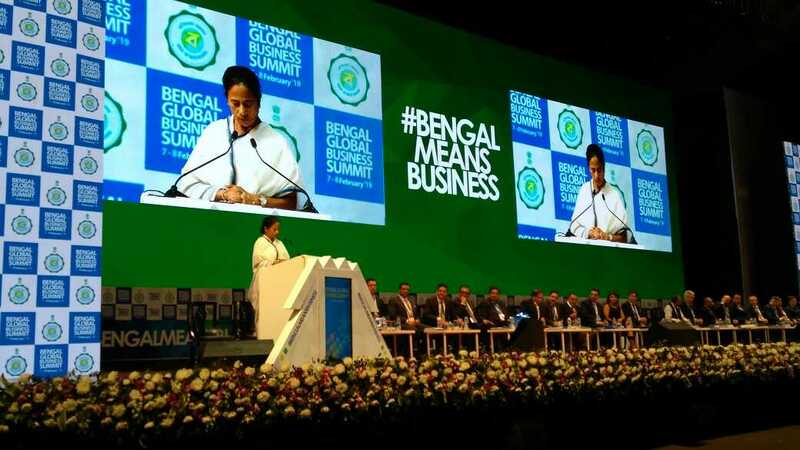 Today at the Bengal Global Business Summit the Institute of Future Cities at Strathclyde signed agreements with the University of Calcutta; the Department of Environment, Government of West Bengal; and Bengal Chamber of Commerce and Industry (BCC&I) to look at the opportunities and challenges created by urban living. Together the partners will identify barriers and solutions to sustainable economic growth; resilience of critical urban systems and infrastructure; environmental sustainability; and health, wellbeing and quality of life for the citizens of Kolkata and West Bengal. The Environment Department has a key role in coordinating action on sustainable development, environmental management, and climate change for the whole of the state of West Bengal. The five-year agreements will see the exchange of ideas, data and expertise and the creation of joint funding bids for research and consultancy, scholarships, a joint Masters programme, joint workshops and conferences and reciprocal visits. In the first year of the agreement the partners will work together to create projects on the development of low-carbon energy for Kolkata, strategies for future city development, optimisation of urban systems such as transport and health, and pollution and noise reduction. Improving air quality has been identified by the partners as a key priority. Mr Bellingham, added: “Rapid urbanisation, and the opportunities and challenges that come with that, are affecting cities around the world, not just in India. “Each city has its own particular set of circumstances, opportunities, challenges so tailored solutions for each city need to be developed through a deep understanding of the city in question and those solutions need to be capable of delivery at a city-wide scale. “Our partnership sets out to understand the specific challenges and opportunities for Kolkata and develop solutions that will be relevant to many cities across the world. That is why we are tackling air pollution – an issue that has huge impacts on millions of lives across the world. Mr Bellingham hosted a workshop with the BCCI on Tuesday 5 February on a Strategic Vision for Emission Control, attended by members of the Government of West Bengal, the West Bengal Pollution Control Board, GP Energy Solutions and Bruce Bucknell, the United Kingdom’s Deputy High Commissioner to India. Strathclyde’s work in Kolkata is financed jointly by the Scottish Government and the UK Government’s Global Challenges Research Fund. The Institute for Future Cities brings together governments, businesses, academics and citizens to imagine and engage with the future of our cities, and explore how to make cities more successful, healthier, safer and more sustainable for us all.